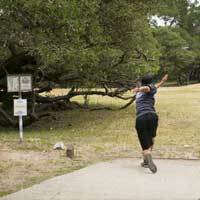 As the name suggests, the aim of Disc Golf is to get a disc from a tee to the target in as few throws as possible. There are hundreds of discs designed specifically for disc golf, although any disc will do for recreational play, and the target is an above-ground ‘basket’ with chains above it to slow the momentum of the disc. 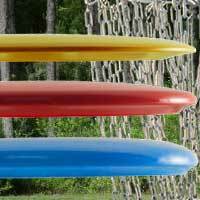 There are four basic components required for Disc Golf: baskets, tees, signs, and discs. Additional items to consider in your design and budget are a practice putting area, benches, rubbish bins, pro shop and landscaping. Disc Golf courses can be installed alongside existing facilities on both public and private land with very little impact, so many of these items may already be inplace. 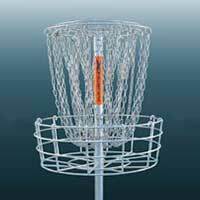 Disc golf baskets are the most important components of a disc golf course. Disc Zoo exclusively supplies DGA baskets, recognised by course designers and professionals worldwide for their class-leading durability and performance. The tee provides a firm and level foundation from which to start play, and each hole can have multiple tee positions. Different materials can be used for tee pads depending on budget, durability and environmental requirements. Tee signs are the map to the hole, providing important information like the distance, par, flight path, hazards, and out of bound areas. 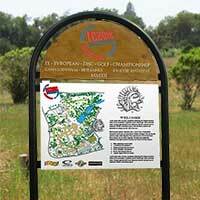 Entrance signs provide new players with rules and etiquette, and are important to the overall usability of the course. Today’s disc golf players use many different discs depending on the course layout. There is a huge range of drivers, mid-range and putters available. Disc Zoo can supply your course with a range of discs tailored to suit your target audience, complete with your own logo.